Clear watered glass with teardrop shaping lends drama and artful sophistication to this transitional 1-light mini pendant in black. A stunning look for any room, this transitional 1-light mini pendant from Uttermost is a fabulous choice that hugs the line between traditional and contemporary. Finished in black, the oblong pendant suspends from the ceiling and features a gorgeous clear watered glass shade in a tear drop shape sure to catch the eye. The striking effect of the watered glass is enhanced with a cool, old-fashioned Edison-style bulb (not included). 14" high x 9" wide x 4" deep. Weighs 7 lbs. Comes with 15-feet of black cord. Sloped ceiling adaptable. Includes one 60 watt T10 bulb. 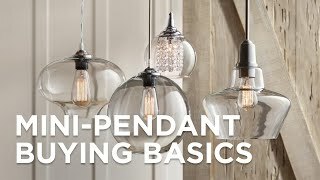 Campester mini pendant by Uttermost. Matte black finish. Black canopy. Clear watered flattened teardrop shaped glass. After installation, how do you adjust the direction they hang, to line them up? The shape of the fixture is not what I expected, and I don't feel it's well represented in the picture. It's like a flattened teardrop...the bottom is oblong, so the teardrop shape only really shows if you are looking straight at the fixture. You don't get that shape from the sides. This pendant was also larger and heavier looking than I expected....not necessarily a negative thing, it's just not a very delicate looking fixture. Because of the flattened shape, it didn't work for me, and I ended up returning it. These pendants are absolutely stunning! Handmade toffee art glass glows warmly in this beautiful mini pendant from the Vetraio Collection.